*T’s & C’s: Christmas activities will be located at the food court. We will try our best to cater to the needs of all customers who participate in any free activities and entertainment, spaces are limited and are based on a first come first serve basis. 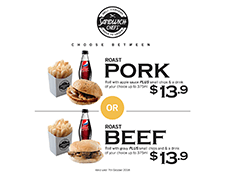 Great Value Breaky & Lunch Meal Deals @ Sandwich Chefs. BREAKY: FREE Small Coffee when you purchase an Egg & Bacon Roll for $6.90* Upgrade to a regular sized coffee for 50c. Let Kumon help develop your child’s calculation and reading ability. 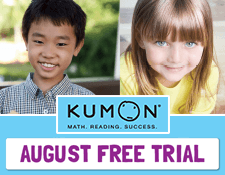 “The structure and expectations of Kumon gave my son great time management skills. It also gave him back his self-confidence that almost disappeared three years ago” – Hazel, a Kumon parent. Spaces are limited so please call Airin on 0423 629 350 to book. How would you like to enjoy your daily caffeine fix for FREE? To celebrate their 30th birthday, Michel's are giving away award-winning coffee for a year to 30 lucky winners! 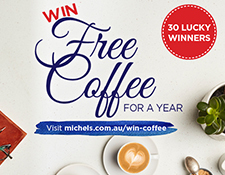 That's right - you could be enjoying a free coffee every day for a year thanks to Michel's. Just visit michels.com.au and follow the prompts to enter. To find out more, head in store and see the friendly team at Michel's today! It's Michel's 30th birthday and what better way to celebrate than with free coffee! For a limited time only, Michel's renowned award-winning coffee will taste even better. 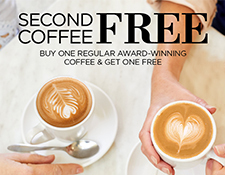 For every regular coffee purchased, receive a second free until the end of July! It's the perfect excuse for your next coffee date, so grab a friend and head in to see the friendly team at Michel's today.